Ching Ming literally means Pure Brightness, hinting at its importance as a celebration of Spring and marking the beginning of the planting season and above all, a sacred day of the dead. Tomb Sweeping Day (the most common English translation) is a day to remember and honour one's ancestors. Young and old pray before their ancestors, weed and sweep the family graves, clean the headstones, offer food, and light incense and burn imitation paper money. In doing so, the Chinese believe that the spirits of deceased ancestors will look after the family. 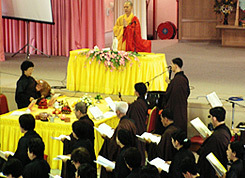 In order to make this Ching Ming Festival more meaningful, Than Hsiang Temple organises a Ching Ming Dharma Assembly with Three Sessions of Pure Land chanting every year. The Three Sessions of Pure Land recollection was compiled by the Yuan Dynasty National Master Zong Fung. 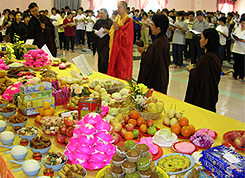 It was conducted as a religious ceremony to help deceased and living (beings). Each of the Three Sessions consists of chanting the Amitabha Sutra, Amitabha Buddha Name Recitation, teachings, praises, repentance, and vow. 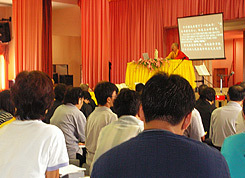 The Teaching of the First Session focuses on Pure Land doctrine of faith, vow and practice, namely chanting of Amitabha Buddha's name. The Teaching of the Second Session focuses on the power of the mind. To purify the mind, one has to use the power of repentance. The Teaching of the Third Session focuses on the chanting of the Amitabha Buddha's name to tame the mind and to seek rebirth in the Pure Land. 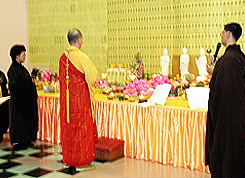 The purpose for having a Ching Ming Dharma Assembly is also to develop gratitude for our parents and ancestors and to transfer merits to the departed ancestors and relatives. Parinamana (offering up of one's merits to all beings for the sake of Bodhicitta, the aspiration for the Enlightenment of all beings ) is part of the Sevenfold Puja. The transfer of merit earned in doing meditation, spiritual cultivation, dana may be given over to help ease the sufferings and misfortunes of others who are less fortunate. May all the merit and grace gained from adorning Buddha's Pure Land, from loving our parents, from serving our country and from respecting all sentient beings be transformed and transferred for the benefit and salvation of all suffering sentient beings on the three evil paths. Furthermore, may we who read and hear this Buddha Dharma and, thereafter, generate our Bodhi Minds, be reborn, at the end of our lives, in the Pure Land.